The plan is to complete a project - start to finish. Shearing day was yesterday. I started out with meeting the alpaca a couple of months ago. His name is "Raffle Tickets" and he's two years old. 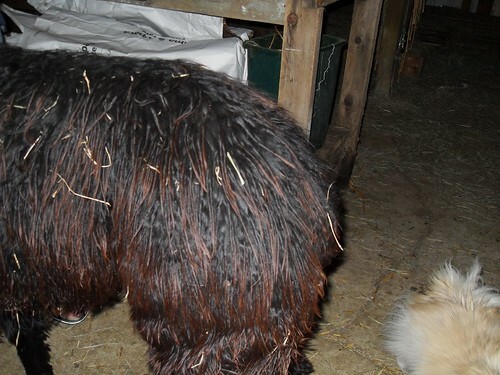 He's also never been sheared so he has a lot of baby hair left and some of the fleece is about a foot long. The "VM" (vegetable matter) that sticks to him is because of the baby hair that is much finer than the adult hair. I was able to spend a few minutes combing him before shearing to remove a lot of it - there's still a lot to go! I don't have a good "pre" photo, but here's what I have: . Here's the process: The shearer has a table that tilts both ways. Starting with the table top "up and down", lead the animal to the table with his (or her - but I'll use "his" because Raffle Tickets is a male) body parallel to the table top. There's a wide belt that goes around his belly and 4 straps that attach to his feet. Mostly we could get two of the foot straps on while the animal was on the ground. You flip the table so it's flat and get the other foot straps on, stretching the beast's legs to either end of the table. 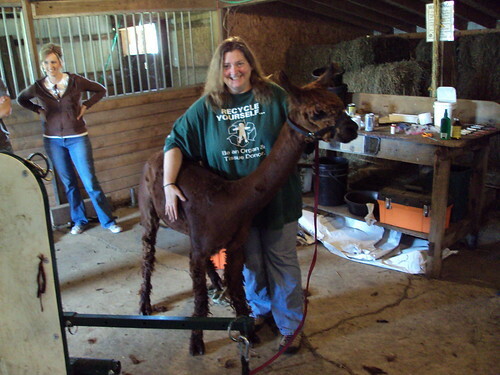 They leave the halter on and as long as the animal's head is immobilized, they don't fight and mostly lay very still. If they think they can move their head, they try to get up. I was the "head holder" for about 8 shearings. 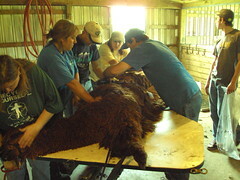 The ranch where I was sorts the fleece into 3 bags (Firsts, seconds, and trash) - based on the consistency of the fleece. The "first" clipping is from the back and sides - if the animal is a "good" animal, up the neck and sometimes the back legs). The "second" is the legs and belly. The "trash" is the shorter stuff from the rest of the neck, legs, etc - whatever didn't get caught in the first two runs). EVEN THE TRASH IS GOOD. Our last trip to the ranch, several bags of trash was donated to our classroom - we're using it to learn to spin and we're doing a lot of needle felting with it. But it's not consistent enough to market. I was a good "head holder". In order to shear the neck and head, you have to take their harness off and hold them by their ears and pick up their heads (it's important to hold their ears up and out of the way so they don't get nicked with the clippers) Then you "throw the head" to a person on the other side of the table; as the head comes up, so does the body and you just sort of flip them over...it's a lot smoother than it sounds. As the shearer gets the other side of the animal, the "head holder" puts the harness back on. As all of this is going on, the animal also has his "top knot" clipped with scissors, gets any shots from the vet and gets his teeth and hooves checked (and trimmed if needed). When all this is done, his feet are let loose and the belt is loosely wrapped around him again (just for steering now) and the table is tilted in the other direction. He gently slides off the table and lands on his feet - all done! Posted in Crafting. Tags: alpaca, Clippers, Clipping, Fleece, Raffle Tickets, Shearer, Shearing Day, Shearings, Vegetable Matter on May 30, 2009 by MzEllen.